I love a hotel room with a view. 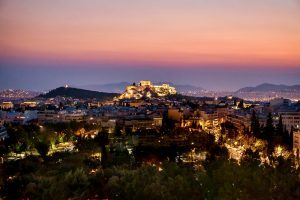 In Athens, you can choose from many with views of the beautiful Acropolis, Lycabettus Hill and the entire city landscape. Many of these venues also have excellent rooftop bars and restaurants. 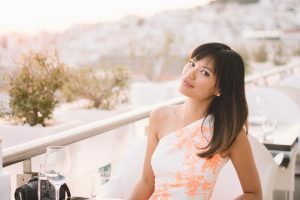 Here are my top picks which include luxury, boutique and budget options. 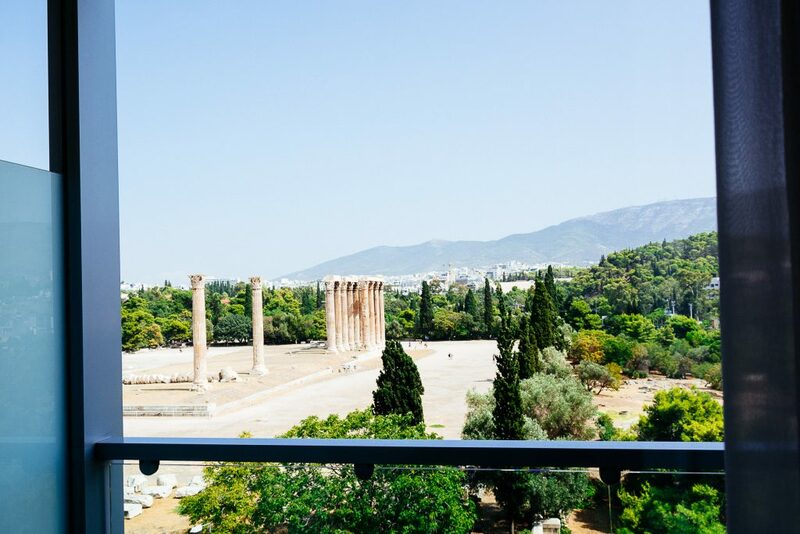 Stunning views at Herodion Hotel. Style all the way at New Hotel. It’s not too pretty from the outside, given the parked cars and the busy city road. That aside, the Athens Gate is a convenient luxury city hotel option. This hotel is within convenient walking distance to major sights. 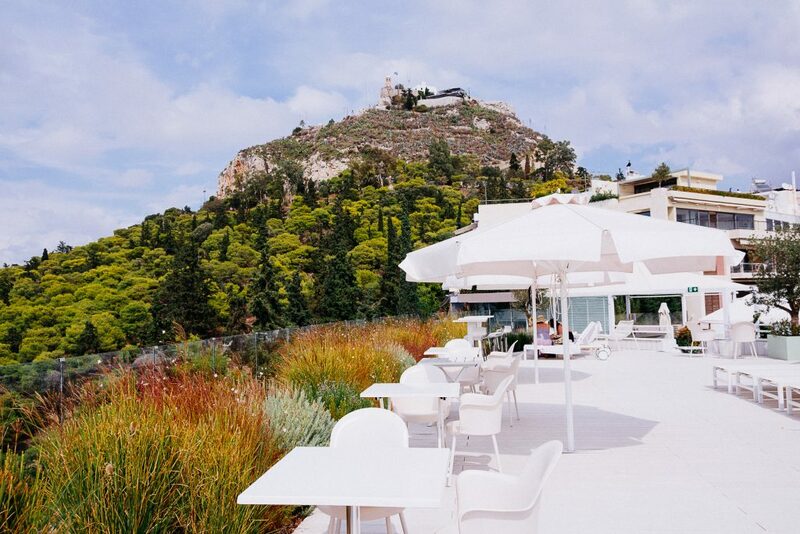 It has a rooftop bar-restaurant featuring views of the Acropolis and the Temple of Zeus. In fact, I think the view to the Temple of Zeus is what makes the views here unique. Cross that busy main city road and you’ll easily reach two of the main archaeological sites worth exploring: Hadrian’s Arch and the Temple of Zeus. Check prices and availability for the Athens Gate Hotel. Athens Gate room view directly facing the Temple of Zeus. The Hilton is a landmark property in Athens. I think it boasts one of the best urban panoramic views from its rooms. You can also have that view from its acclaimed rooftop bar and restaurant. The dining options at the Athens Hilton are excellent. Locals make it a point of reserving a table here for a special night out. The sushi menu and the cocktails are the best in town. Sunset view from the Athens Hilton rooftop. Photo by David Sweeney/SundownTraveler. The Hilton is a few minutes’ walk from upmarket Kolonaki district and the Evangelismos metro station. The Athens Concert Hall and several key museums are within close walking distance too. Click here to check availability and the best prices for the Hilton, Athens. 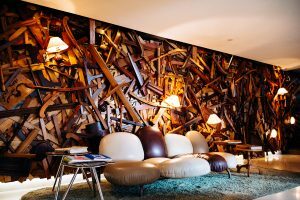 This design-focused hotel shows off the modern, hip culture of Athens through its beautiful contemporary look. 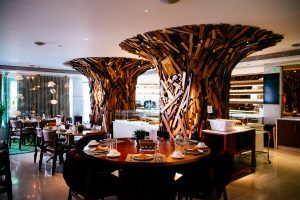 Ground floor restaurant at the New Hotel. Lobby at the New Hotel in Athens. As for the view, I loved what I encountered at its impressive rooftop bar-restaurant. The big surprise was the unique Penthouse Suite. How about this rooftop bed? Rooftop bed at the New Hotel’s Penthouse Suite. 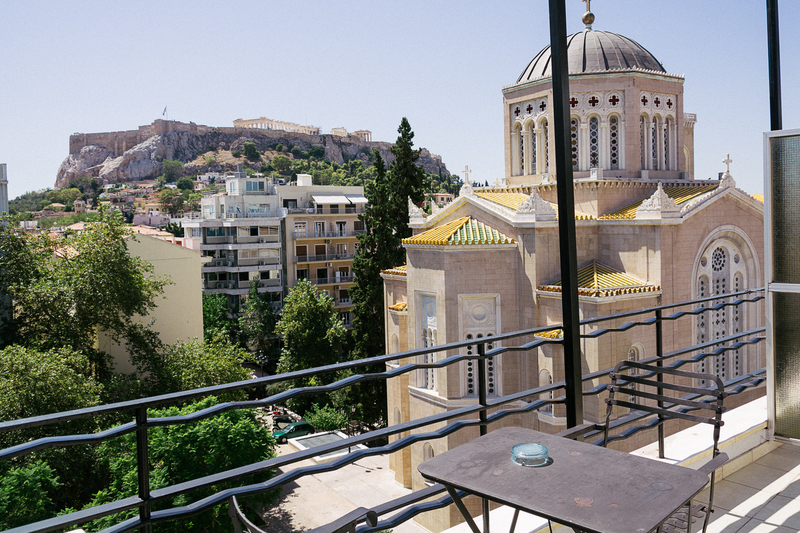 The hotel is in Syntagma district and within walking distance to major neighborhoods featuring the city’s top sights. Click here to check the best prices and availability at the New Hotel. Truth be told, the Radisson isn’t situated in the best neighborhood of Athens. It sits is across from a somewhat dodgy-at-night Pedion Areos Park an equally dodgy metro stop called Victoria. Still, this area is relatively safe – just note that is not in an uber-touristic area. 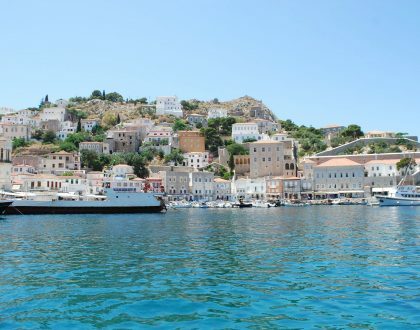 Also note that the Victoria metro stop is a straight ride to the Port of Piraeus where you’ll want to catch a ferry ride to the islands. I found the view here to be quite charming when compared to the other similar hotel views. The panorama was of the city’s mangle of rooftops (what I think gives Athens its gritty charm), the Acropolis and Lycabettus Hill. 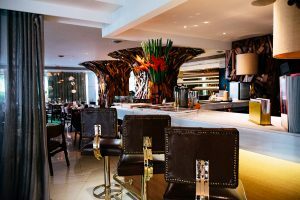 The Radisson Blu Athens also has a rooftop pool as well as an excellent rooftop gourmet restaurant and bar which offers unobstructed views including one of the Acropolis. This contemporary chain hotel offers all the goods that you’d expect from a Radisson. Check prices and availability at the Radisson Blu Athens. 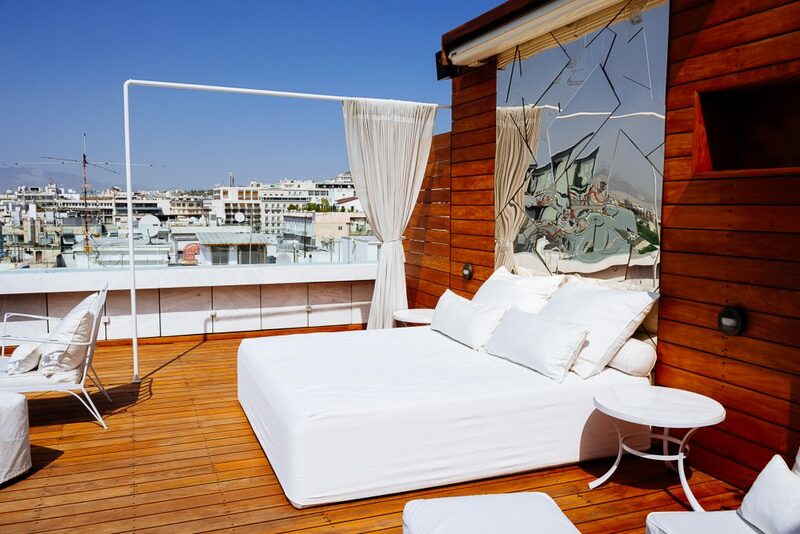 This is one of the best luxury boutique stays in Athens. 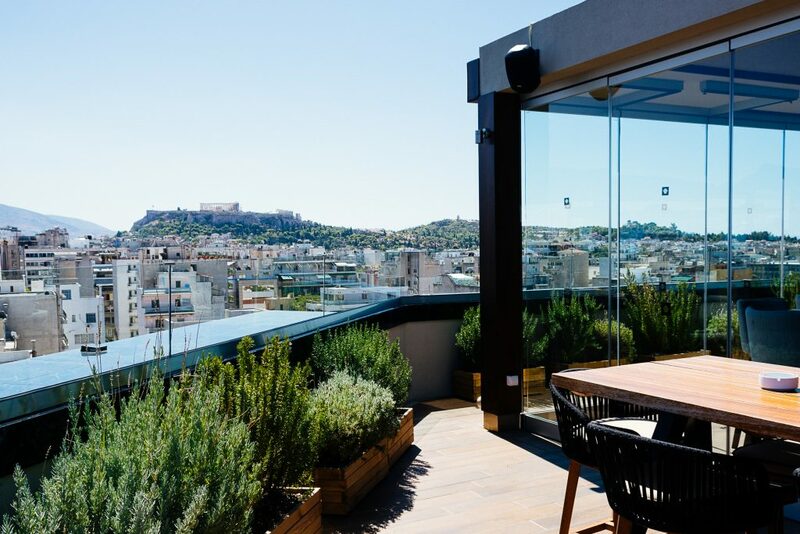 It is situated in central, upmarket Kolonaki and from its rooftop you can take in stunning views of the Acropolis and Lycabettus Hill. St. George’s rooftop restaurant view is beautiful. View of St. George church on Lycabettus Hill in Kolonaki. The hotel also sets itself apart by offering unique amenities including an on-site movie theatre, art gallery and yoga sessions. 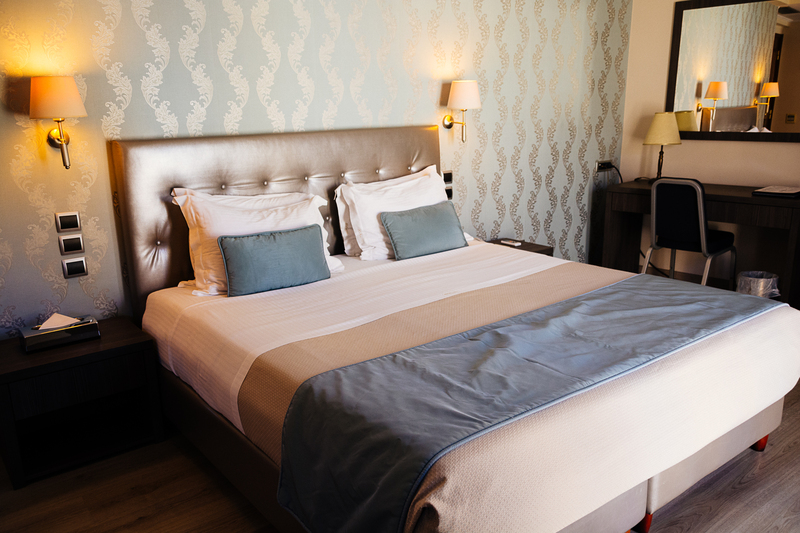 Check out the best prices and availability at the St. George Lycabettus hotel. You can expect modern conveniences at this Wyndham which is a luxury city centre hotel. It is right off Karaiskaki Square and I must say that neighborhood immediately around it isn’t the best at night — so keep that in mind. However, it is conveniently close to a metro stop. 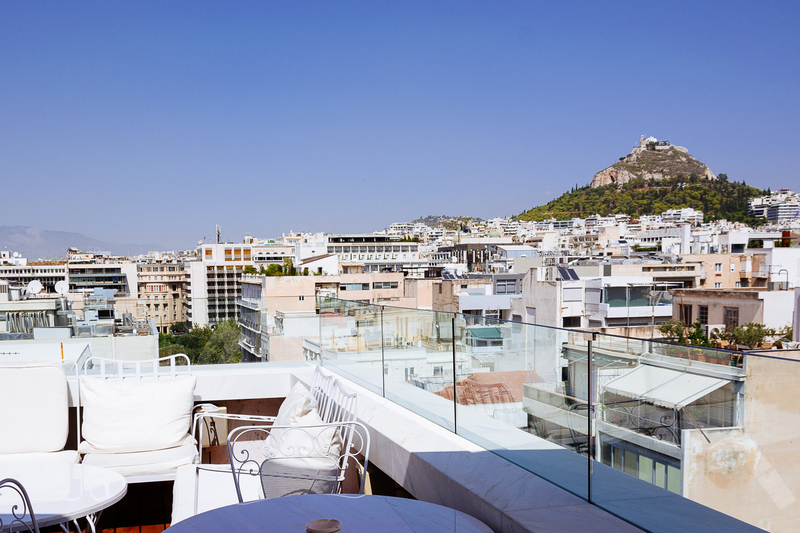 An Acropolis view can be admired from its rooftop pool, bar and restaurant with beautiful 360-degree view of the city. 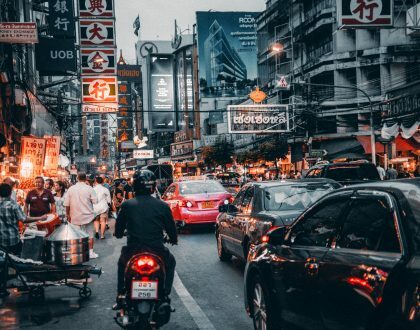 The Wyndham is a 10- to 15-minute walking distance to artsy neighborhoods known for their gritty, hipster character including Metaxourgeio, Psirri, Exarchia and Gazi. All fine during the day but note, as I wrote earlier, parts of Metaxourgeio and Exarchia can be dodgy at night. Check prices and availability at the Wyndham Grand Athens. This hotel has a great location, right in scenic Monastriraki Square. 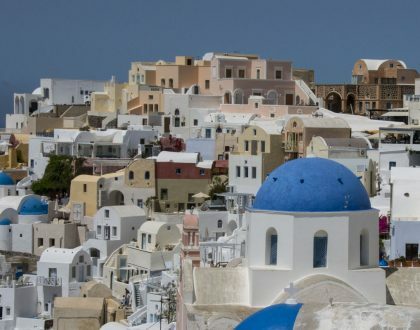 The metro, which is just steps away is a direct Blue Line connection to the Athens International Airport and the Green Line direct metro/train connection to the Port of Piraeus where you’ll likely be jetting off to the Greek islands. 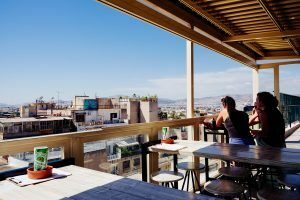 The hotel is a favorite among locals for its rooftop bar cafe with stunning views of the Acropolis. Some of its modern boutique rooms also offer an equally impressive city panorama. Check prices and availability for A for Athens. If you’re looking for something quiet and quaint check out this hotel which is open all year round. It specializes in offering extended stay accommodation meaning you’ll find spacious rooms and fully-equipped kitchenettes. 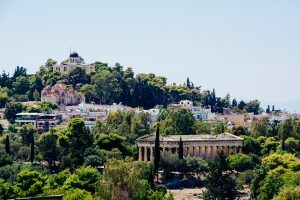 It’s within the little streets of Plaka, one of the city’s prettiest districts, and within easy walking distance to the city’s major sights. 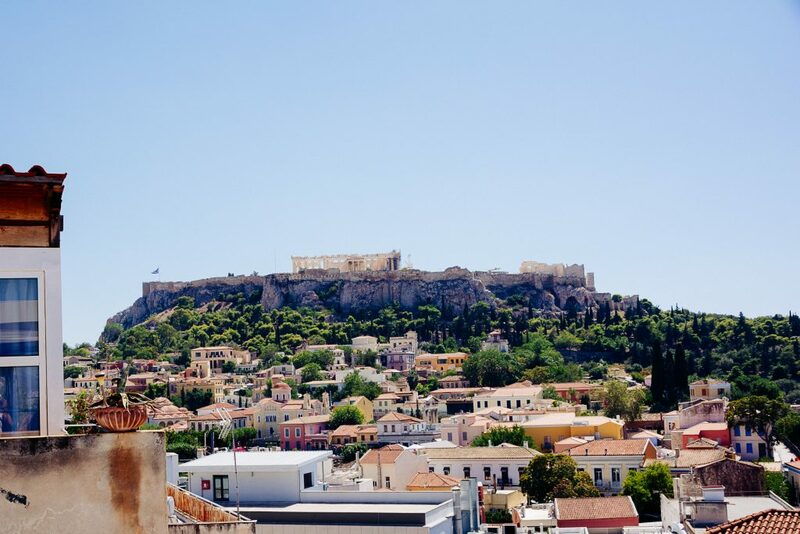 There is a view of Plaka from the balconies and some suites have great in-your-face Acropolis views. 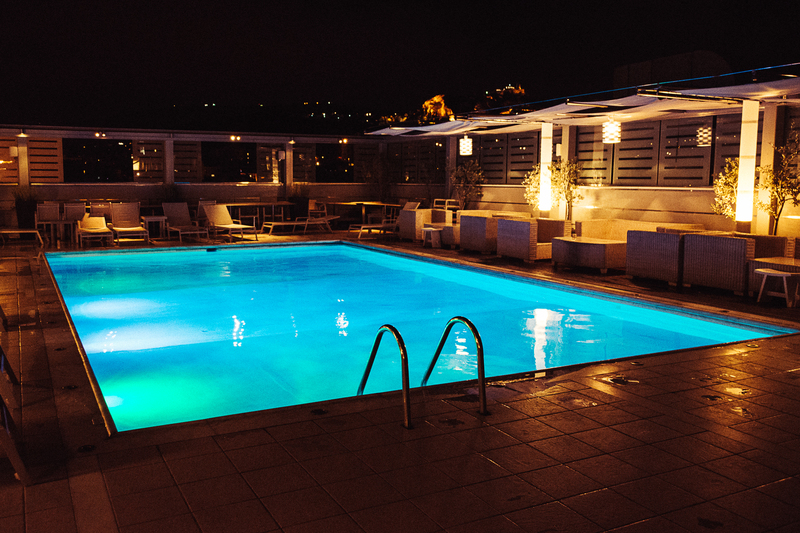 Check prices and availability for the AVA Hotel Athens. This is one of my favorite hotels for a few reasons. It is family-run place. It has a great location too, sitting in the shadow of the Acropolis and the Acropolis Museum and within walking distance of major sights. The view is also just incredibly impressive from its excellent rooftop bar and restaurant. You must try the dishes and cocktails at both the Bistro and the rooftop restaurant. The Acropolis metro stop is just a three-minute walk away. Check prices and availability for the Herodion Hotel in Athens. This cozy, cheerful and casual boutique hostel is located in the hip yet central Psirri district. It has lots of communal spaces which is great for meeting people. As for the view, I loved the scenic rooftop bar restaurant which also holds a happy hour every day. Check prices and availability for the AthenStyle hostel. If you are looking for clean, basic rooms with an amazing view – and centrally located? The Metropolis Hotel is a great option. It’s within a few minutes’ walk from Syntagma Square which is super central. It features a simple rooftop area (for breakfast and relaxing during the day). 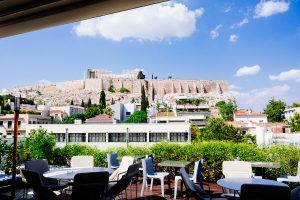 The rooms have some of the best views of the Acropolis and the city even when compared to the big luxury hotels in town. Not to be confused with the Electra Metropolis luxury hotel down the very same street. 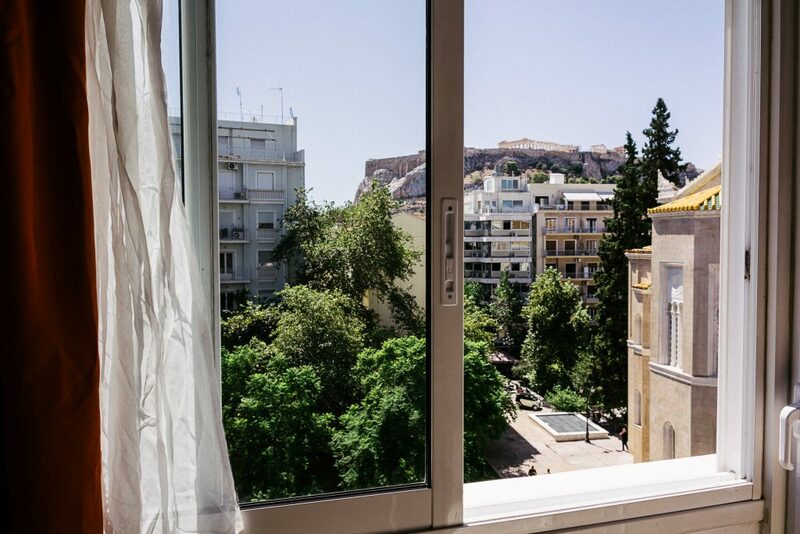 Check prices and availability for the Metropolis Hotel in Athens. 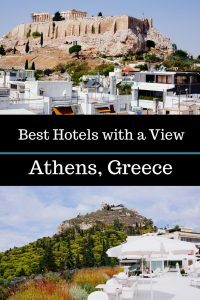 This post sums up some of my favorite hotels in Athens — with a killer view. I’ve reviewed them all as a travel journalist so I can recommend them from first-hand experience. Have you ever stayed at one of these hotels? 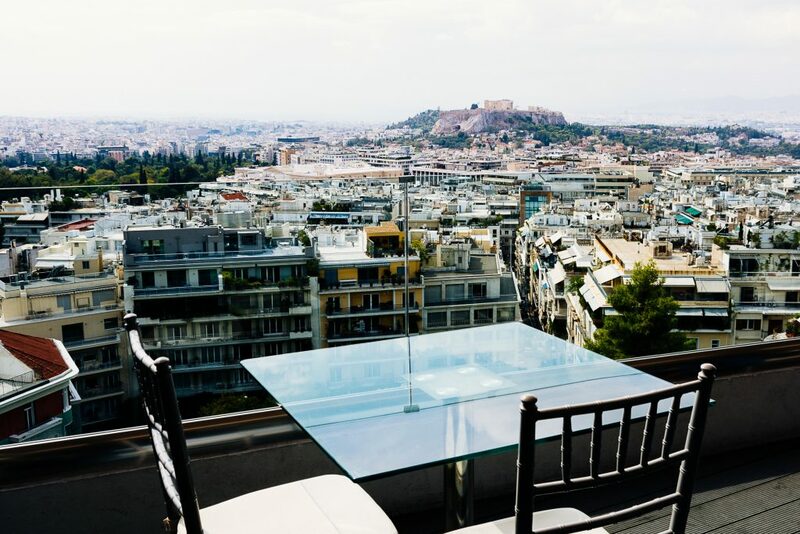 Do you have any suggestions for a great Athens city hotel with a view? I would love to travel in Greece. It such a nice country. Let’s hope this will happen this year. Hi Danielle, It is a wonderful place to visit. I hope you will go this year too! I would love to go to Greece. It is such a fascinating country. Hi Mireille, It really is! I hope you go one day. These pictures just make me want to go to Greece. This country landscape is so wonderful, and deserves to be shooted. Oh, thanks so much! Yes, everything is a photo opportunity here. We stayed in Hilton Athens for five very comfortable nights and highly recommend this hotel. We stayed in an Executive room with an Acropolis view. Well worth it. All staffs are welcoming and friendly. Exec lounge offering is a little limited but nice nonetheless and really, you want to sample the local bars. Could do with dimming the lights in the evening so you can see the glorious view. And it is glorious. Hi Stephanie, Thanks for the tips. Ahh, yes indeed that view is glorious.